As soon as he announced dropping ‘Sandakozhi’ to be directed by N Lingusamy, Vishal has started working on his next project, to be helmed by Mysskin. The movie has been titled ‘Thupparivalan’. The film was launched yesterday with a formal muhurat at Vishal’s Office. Vishal’s is now busy with the shoot of his upcoming film titled Marudhu which has him pairing up opposite Sri Divya for the first time. Directed by M. Muhauaiah of Kutti Puli and Komban fame, the film has Radha Rai, Sooru and R.K. Suresh as his co-stars. Mysskin is busy with the making of Savarakaththi and after the completion of both the projects, the duo would be joining hands for Thupparivalan. 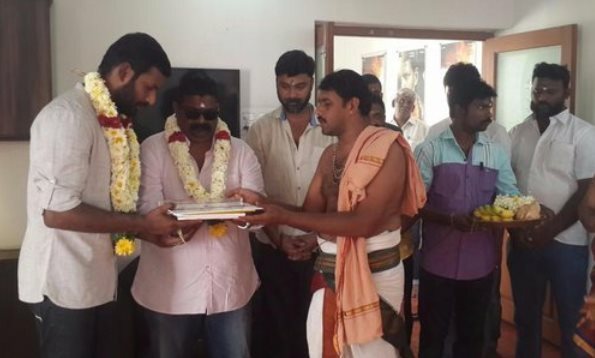 Vishal has allotted bulk dates to Myssking for the shoot of the new film as his Sandakozhi 2 was abandoned. As the title suggests, the film will be an investigative thriller and Vishal plays the title role- that of a detective. Details about the other cast and crew of the movie will be revealed soon. Billed as an action-packed thriller, Thupparivalan would be the 21st film in his career. Meanwhile, Vishal’s ‘Marudhu’ directed by Muthaiah of ‘Kuttipuli’ and ‘Komban’ fame is almost ready. Post production works are going on in full swing and the film will hit the screens by April or May, sources said.